Seaside Montessori welcomes all potential enrollees seeking a preschool and kindergarten program located on the South Shore, MA. We are located in close proximity to residents in Hull, Hingham, Cohasset, Scituate and towns on the South Shore, MA. The admissions process at Seaside Montessori commences in November for the following school year. Within this section you will find enrollment forms as well as details on the program offerings available and the associated tuition expenses. 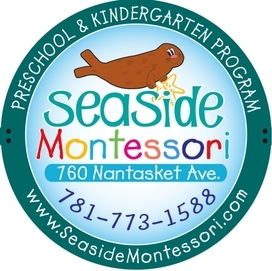 Seaside Montessori welcomes all enrollees seeking a preschool program located on the South Shore of Massachusetts. The Seaside Montessori admissions process involves a parent and child meeting with the Director as well as a tour of the facility and discussion of the curriculum and expectations. The aim of this process is to eliminate any misconceptions related to the program prior to committing to the school year. A first month's deposit is due April 1st for new enrollees and May 1st for returning students to secure a spot in the 2019/2020 school year. Deposits are applied to the tuition balance. Spaces will be granted following the completion of the requirements as outlined above. Priority will be granted to 5 day, full day candidates. If interested in enrolling in the current 2018/2019 school year, please call the office at (781) 773-1588 to inquire on space availability.